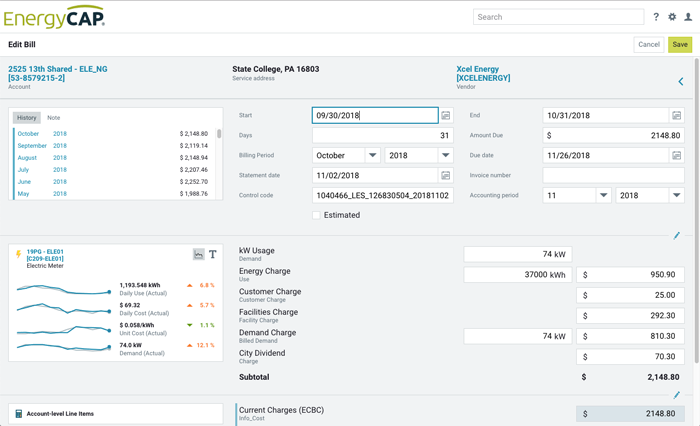 Utility bill data is the most critical element in EnergyCAP analytics, and you have the option of entering your bill data manually, importing billing data files (XLS, CSV, DAT, ZIP), or letting us do the work for you through our Bill CAPture service. Using OCR and other technologies, our Bill CAPture service can convert your PDF, XLS, TXT, CSV, and/or EDI 810 file formats, and even your paper bills, to a format that is then imported into your EnergyCAP database. From there, your data can be audited, analyzed, presented, and even exported to your accounting system.